I blogged the other day that I’m going to be engaging in some art experimentation, playing with different media, drawing styles, and software. My goal is to find a way to expedite my comic making* without sacrificing quality, and maybe have a little fun along the way. I think some of you might enjoy peeking behind the curtain as I go, so I’ve decided to blog some thoughts along the way both here and via my Google Plus account. Working with different media and styles may be fun, but software is one of the sticky wickets I’m less excited about in this experiment. Of course, it’s a critical component. Long story short: I used to use Photoshop to draw my strips, but I bought a new computer in January, with which my old copy of Photoshop isn’t compatible. I’m a skinflint, so rather than shell out the many clams for a new version, I’ve been exploring alternative applications. I’ve enjoyed good lineart drawing results from a switch to Manga Studio, but I still haven’t found a suitable replacement when it comes to compositing real-media artwork into the strip template. Monday’s pencil strip is a good example. I didn’t realize it was doing it at the time, but Manga Studio converted all my pencil grays into screentone dots. I think I can get around that, but the other pesky nit I pick with MS is that it won’t let me resize an art file on the fly, so if I need more vertical space for artwork or speech balloons, I have to create a whole new file and drag everything into it. Wednesday’s pencil strip came out better, but only because I got my hands temporarily on Photoshop for the effort. Even if I continue this way, there are aspects of compositing a pencil strip into my template and workflow that I’m not overly fond of. Case in point: I don’t like the solid black lines of the speech balloons and borders over the softer pencil art. This calls for more experiments! Check back on Friday; I think I’m going to try something really off the wall with the drawing style. Didn’t mean to start out on a complainy tone, by the way. Just wanted to add a little more context to my report on software exploration. The good news is that I now know a little bit more about how to work with the Gimp–I was able to get Friday’s strip composited and prepped totally in Gimp this go ’round. The bad news is it still doesn’t do everything I want in quite the way I want it. The most basic concern may be with line quality–I tried drawing Friday’s speech balloons in Gimp, and they were all wobbly and… icky looking. Good news the second, though: I was at least able to figure out how to stop Manga Studio from turning my gray pencil art into screentones, so I could finish up the balloons with those nice smooth Manga Studio lines. 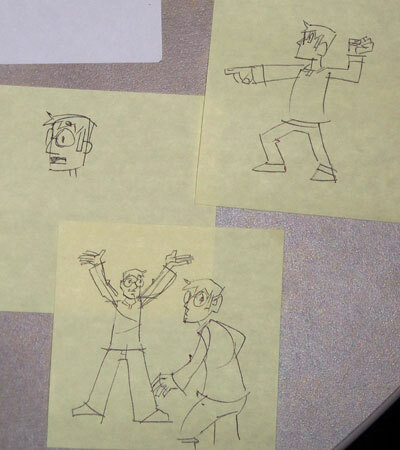 The other big push for Friday’s experiment was drawing style. I had some fun flipping back and forth between Wednesday’s strip and Friday’s; it’s fascinating to me how I’ve stumbled into putting so much detail and precision into my drawings. Friday’s goal was to put some of the “cartoon” back in. Hey, parting note: If you have insight into any of these different apps I’ve struggled with, I would love to hear from you! While last week’s art experiments with the strip were focused on pencils (and software), this week’s have been more about inks. Specifically, the tool I use to ink. The dive into pencil-only strips was predicated on the idea that not finishing the art with inks would make the process faster. In truth, scanning and compiling the pencils into strips meant the overall process wasn’t saving me as much time as I’d expected, and the results were leaving me less than satisfied. This isn’t the first time I’ve ended with sketches or pencils as a time saver (see these summer arcs from 2010 and 2012). Sometimes I dig the results, but overall, I think I’m a sucker for strong black lines. Wednesday’s strip was inked in Microns, my weapon of choice prior to the digital switch. As with the pen, I cut one too many corners by drawing too small. The end result looks rough to my eye (and not artistically rough). It did make me think about the ligne claire style–which Microns are well suited for–as it’s been executed or interpreted by folks like Herge, Mike Mignola, and even Jim Mahfood. If I try that route, I think the lines have to be more precision-placed, as opposed to the sketchier look of my work on Wednesday. All told, though, the traditional media inking still has the same old drawbacks that pushed me to digital years ago: corrections are somewhat more cumbersome to make, and you still have to scan and compile the art into the computer for wrap-up. I think I’m going to give the brush pen another go, drawing larger. I’m trying to salvage free moments in time by drawing the strips in my sketchbook, so I’ll have to get creative about how I approach that. A parting note on software: After one more good college try with Gimp, I slapped my inner Scrooge into submission and got myself the latest Photoshop. The oddities like floating layers, poor freehand line quality, unexpected behavior for selection and move features, and constant crashes while editing text just were eating up too much of my time (which is why Monday’s strip has no gray tones). No offense to Gimp aficionados, just wanted to cap my software tale, and say that–whatever software you’re used to–it’s nice to be “home” again. I promised in my last Artsperimentation Blog post that I’d share some of the style experiments I’ve been conducting. I’m finding it very hard to pull myself away from the three-dimensional, relatively detailed, and “iconically-realistic” approach I’ve evolved for Odori Park. Even when I stretch the boundaries to infuse more “cartoon” into my drawings (starting with last Friday’s strip), it’s not taking me very far. I’ve been looking to some other artists for inspiration. Folks like Bryan Lee O’Malley and Joel Carroll have a style I find compelling, although when I adopt flavors of it, it’s not any faster to produce. I’ve also looked at art from folks like Graham Annable, and I’m thinking back to classic newspaper strips like Peanuts. 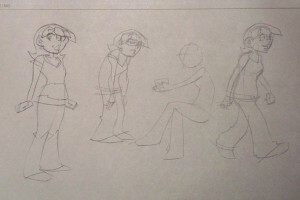 I can’t envision, though, how these characters I’ve created–and the various camera angles and settings I present them in–could work effectively in a more 2D world. I’m going to push my limits more on this next week, I think. For now, here’s a look at some sketches from the past couple weeks. (I was really enjoying where some of the Arisa sketches were going. 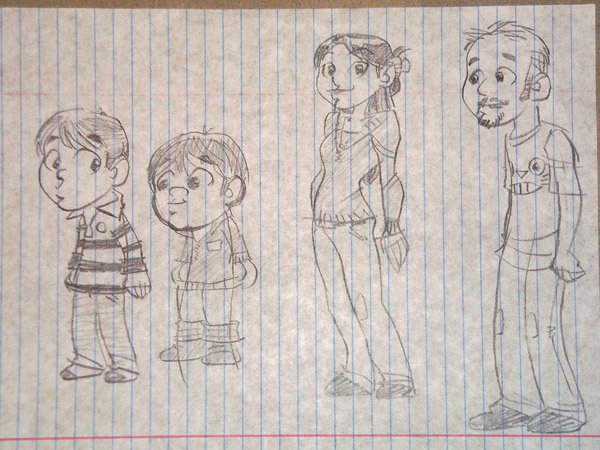 I should also note that one loose-leaf notebook sheet has drawings of me and my family on it. ) Click any thumbnail to enlarge. I should mention that, last night, I had a great chat with John Forcucci and Britt Snyder. John mentioned that it was exciting to see me experimenting and stretching my artistic boundaries. I’ve been so focused on the efficiency goal of this exercise, that I may have been robbing myself of some of the fun of experimentation. In truth, when I forget myself, it has been tons of fun. With the rather broad stylistic departure I took in my strip for this past Friday, I think I’m satisfied–for the time being–with my “artsperiments.” I’ve learned a bit about what makes me faster, what I dig seeing in my own art, and what I want to do more of. I thought it might be fun as a capper to share some of these deep inner realizations. The level of detail in my strips seems to have less to do with the amount of time it takes to draw them than the energy I put into them. If I’m not having fun with the drawing in any style, I’ll lose focus and energy. Heavy detail on difficult poses or complicated backgrounds doesn’t help, though. I can be looser and wibbly-wobblier, and the extra cartooniness helps the end result have energy of its own. Limbs and body postures can get stiff when I overthink them; these are big beneficiaries of a wibblier wobblier approach, if I can avoid overconstructing the underlying structure. I dig solid-shape curvy-line torsos. I’m thinking of art like Bryan Lee O’Malley’s and Bruce Timm’s, where single strong lines define the contours of the body forms. Chunky calf-to-foot with tiny feet styles are interesting, too, although I’m taking this on a transformative path into my own style. I’ve tried a bunch of different eyes. The “hollow pupil” approach is kind of appealing, but ultimately, I’m gravitating back to what I’ve drawn for a while. I’m going to play with streamlining a lot of the overly complicated lines around my characters’ heads. Think of the top of Arisa’s hair as it breaks into her bangs and the flip in the back, or the dips in the head shapes near the eyes. I don’t need to overdo while linework on black shapes; the form should do most of the communicating. Unless I’m genuinely going for a pure page-to-screen sketch experience, doing the work digitally still saves time. That said, some days, I should shut off the Internet while I’m working digitally. On a side note, I’ve also started getting some tips on focus, avoiding distraction and maximizing productivity. One thing that’s helping is mindfulness practice, including “mindfulness of breathing” meditation (like muscle-building for the ability to keep your mind on one thing) and keeping a log of where my focus strays. It’s been setting the right tone and helping me keep my wandering mind in check. 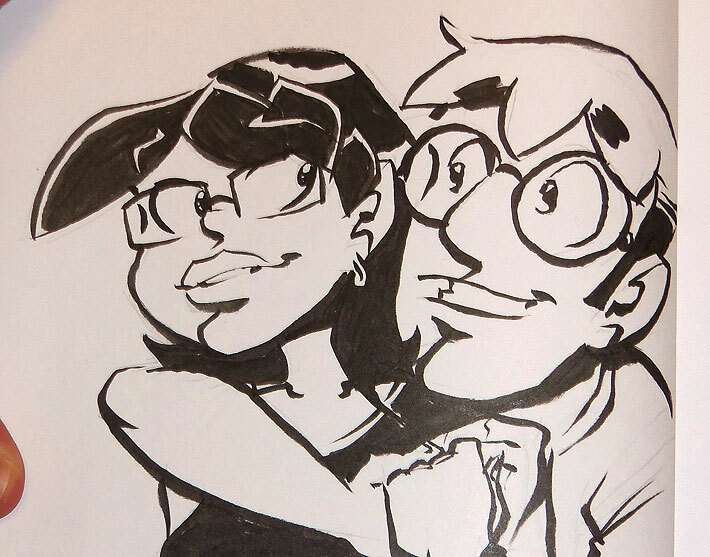 My wife had a thought about that cartoonier style–that it might be neat for one-off side-story gags. 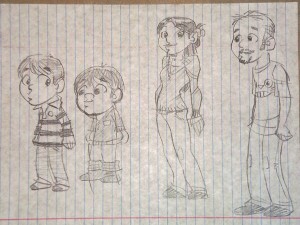 I might try that; it could be fun to envision the characters in these different styles on a regular basis. That’s all for now, folks. Back to the drawing tablet! Evil Finger - The first strip, drawn in ink on paper, with very little sense of how I’d want to draw the characters going forward. In the Red - The first strip after I decided to take OP online. Note the start of sepia tones here. I was also doing all my inking digitally by now. Utility - I did some streamlining of character head designs starting here, to make them faster and easier to draw. Ocean Lullaby - My first crayon strip. A crayonstraveganza. I got the idea while drawing pictures with my son. Ring 1 - The start of my Ring parody. I wanted a scratchy horrorific look, so I drew these in ballpoint pen on bristol board. 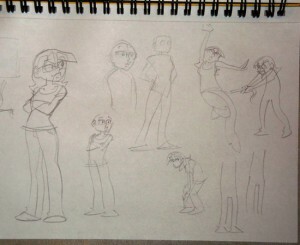 Intermission - A pen-drawn strip I did as a filler. 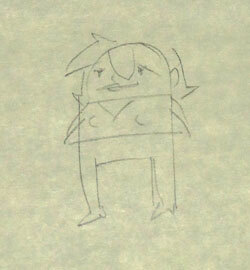 I still like the gag, but I shouldn’t have tried to save time by drawing as small as I did. Saccharintastic - One of the few strips with color after my initial run of syndicate submission strips. I felt it needed the color to sell the gag. Being in grayscale the first two panels gives it even more punch. The Beholder - My son did an awesome pirate drawing, and I wanted to include it in the comic. Arts and Cramps - Back to the crayons for this and the strip that follows it. It’s a ubiquitous medium in a house with l’il ‘uns. Little Frog - I played with a brush pen in this story, to give parts a storybook feel. I think my handling of the tool has improved, but it was still a fun experiment. TWCL Awards - A full color strip I did for The Web Comic List Awards. Very shiny. Fright or Flight - A real departure in medium: black house paint on a wall, done as part of a gallery installation. Got the Time - Done as part of the same gallery mural. Maybe the first time I really ignored traditional comic strip boundaries. Daikaiju - I was inspired by the last experiment to break boundaries again. Sketchbook: Fired Up - My first sketchbook run, done very “low-fi” to keep updates rolling while I was traveling with my family in Japan. Quit While You’re Ahead - Crayons, Post-It Notes, and a bunch of other odd materials in this storyline. It started as a way to catch up on time, but turned into a household media exploration. Thoroughly Appalled - This one’s a little more subtle. I tried getting a bit looser in my drawing around this time. The Proposal, Part 1 - I drew this storyline in a book page format, with the longer overall story in mind. I’d planned it for my first book, but couldn’t get it finished in time, so I ran it on the site, instead. In His House at R’leyh - A bit of brush pen and textured paper in this one. The Trouble with Ninjas - More of my son’s handiwork. I couldn’t resist putting this in a strip. Learn Japanese, Part 1 - Inspired by the Draw Something app, I tried fast and loose drawing with blocks of sepia first, then sketchy ink lines over top. I carried aspects of this forward with me, like the rough brush toning. The Yawn of Adventure - To make this storyline look like an amalgam of classic video games, I played with angles and art styles throughout. It was fun, but referencing other art styles always takes me time. 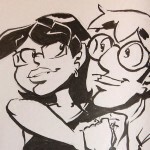 Summer Sketchbook: I Don’t Care - Another sketchbook run, but more full strips this time. We had a busy summer this year, after our state to state move, so I played with pencils for a while to catch up. I toyed with the idea of carrying on permanently with pencil, but I like the look of ink lines too much. Fails from the Crypt - I went back to the old ballpoint for this Halloween story, but added in some textured backgrounds for a creepy feel. Note the several font changes throughout the story–byproducts of computer troubles. L’impertinente Lemure - And here’s the start of November’s artsperimentation set. See the blog posts marked “artsperiment” for what I took away from the process! Hope that was interesting for you. Any thoughts about the choices I’ve made, or suggestions for future experiments? Please leave a comment or drop a line and let me know!